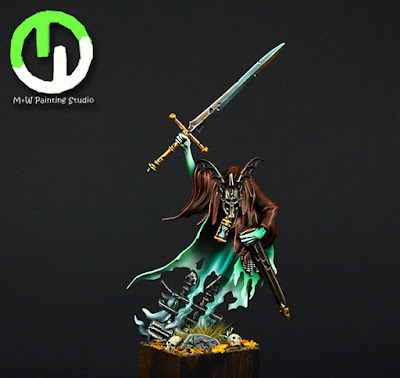 The Knight of Shrouds is my favorite of the new Harbinger models. 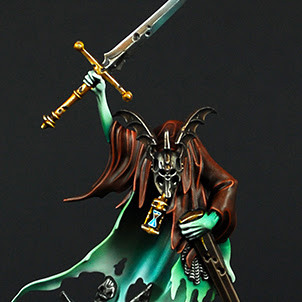 Obviously, I have a preference for Nighthaunt, but it's still just such a cool model. This take on it follows pretty closely to the studio version, but pushes the saturation way up. It makes this model much brighter. Everything is smooth and crisp, with the blends on the ghostly bits being particularly smooth. I really like the blade on the sword. They've managed to work in some of the ghostly colors and give it a bit of an ethereal feel while still looking like a really blade. Instead of mounting the model on a base, this one is mounted directly onto a display plinth, which gives it a bit of an old school vibe since it's square. The basing is fairly simple, with just some foliage and skulls, but it sets the scene perfectly. It looks like an old graveyard and doesn't distract from the model itself.